AWANA Clubs start Wednesday, September 12, 6:45-8:00 p.m. This is the place to be on Wednesdays (September-May). Children from age three through grade five are divided into three age groups that participate in Bible study, Scripture memory, and games. There are special activity nights, service projects, and awards for the work that the children complete. Registration is open for the 2018-2019 clubs. To register online click HERE. 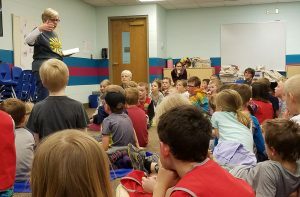 If you have not created a KidCheck account, you will need to complete that process and then re-click the link to register for AWANA. Registration fee is $45/child. The fee helps offset the cost of books, uniforms, and awards. If this fee would prevent your child from participating, please contact Pastor Alice Johnson for scholarship assistance.